Féilim Mac An Iomaire's advertisement on the Merrion Road is his last chance at finding work in Ireland and avoiding emigration. A UNEMPLOYED COMMERCE graduate has taken an unusual step in his efforts to find work and avoid having to leave Ireland: taking out an advertisement on a billboard advertising his availability for work. Féilim Mac An Iomaire, 26, returned from work in Australia last August but has spent the nine last months fruitlessly seeking work in his chosen field of sales and marketing. Now, frustrated by the absence of any approachable prospects, Mac An Iomaire has commissioned a public advertisement on a billboard on a busy road in south Dublin – hoping that the attention will help to find him a job. The advertisement, unveiled yesterday on Merrion Road and running for two weeks, is costing Mac An Iomaire around €2,000 – the last of the savings he had built up from his time working in Australia. The idea for the advertisement was borne out of his desire show his strength in “being able to think outside the box – something that’s hard to articulate in a CV”. I had the money saved, so I thought: let’s run with it. Connemara native Mac An Iomaire – who holds a Bachelor of Commerce degree – had originally moved to Australia having gotten work as a travel agent, but was let go early when the strength of the Aussie dollar meant a weaker tourist season than had been anticipated. Having been let go a few months prematurely as a result, Féilim was then hired as an entertainment coordinator for a hotel and hostel – the first time he was able to “exercise my creative side”, he says. He had previously worked in sales, insurance and event management. If forced to leave, Féilim says he is most likely to follow some leads offered by his friends in London; though he enjoyed working in Australia, the visa requirements for settling into a career are too cumbersome, he says. The reception to his campaign had already been overwhelmingly positive and had created a “huge amount of goodwill”, helping him to keep his options open – but Mac An Iomaire says the clock is ticking on whether the campaign can work. Email “'Jobless Paddy' takes out billboard advert in bid to stave off emigration”. 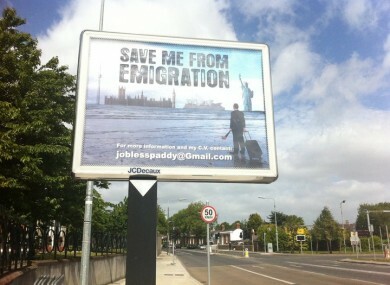 Feedback on “'Jobless Paddy' takes out billboard advert in bid to stave off emigration”.